Recent developments in the fields of electronics, computer systems and communication technology have enabled the use of many new concepts within inspection and monitoring. ULTRAMONIT is one such example where we try to extend the use of ultrasonic measurements in terms of accuracy and what we can measure. 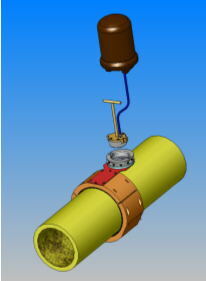 In this concept, an array of ultrasonic sensors is placed permanently onto the pipe. The location of these sensors will typically be in a field joint directly at, or close to a weld, and the objective will be to monitor for corrosion attacks and cracks. Permanently installed sensors are advantageous as exact position, orientation and acoustic coupling are maintained between surveys. Compared to conventional ultrasonic inspection, this means significantly improved possibilities for high-resolution trend analysis of the data. Under good conditions, UT wall-thickness can be measured with a resolution in the order of 0.01 mm. Using fixed sensors; such very high resolution could be made available for monitoring purposes. Two versions of this system are developed, one for use on subsea pipelines, and one for use topside or on land facilities. ULTRAMONIT Subsea is implemented as an instrumented pipeline clamp, where the required electronics and sensors are placed and protected in a rugged steel structure. Reliability has been a key objective for this concept, and has been addressed by keeping the permanently installed electronics as simple as possible, while making the more complicated parts of the instrumentation accessible in an ROV carried unit. This ROV is used for interrogation with the sensors by use of a specially developed inductive coupler, which provides power, analog signal for the ultrasonic transducers, and digital communication for the signal multiplexer. This unit is controlled digitally and the number of channels is only limited by signal degradation due to total spanned length of analog cable, as the channel count gets very high. Two 48-channel prototype clamps have been lab tested so far, one for 10" and one for 32" pipe diameter. However, both HW and SW is ready for any practical number of channels. Topside/land facilities version of this same system is installed on a 12" pipe at the Kårstø gas processing plant. This unit has been running since December 2003. Pipeline systems in service are commonly exposed to corrosive and erosive environmental conditions. As such conditions may change over time, some form of corrosion/erosion monitoring program will be crucial for the maintenance of a safe level of operation. Ultrasonic measurement of wall thickness is widely accepted as the most accurate method for assessment of corrosion. Likewise, ultrasonic methods are very well suited for detection and monitoring of cracks. However, when very high levels of accuracy or defect sensitivity is desired, one will find that ultrasonic methods suffer from practical limitations in repetitiveness of measurements, e.g. regarding sensor re-location and acoustic coupling from one survey to another. The performance of these methods may be increased by the use of permanently mounted ultrasound probes, and this is the main idea with ULTRAMONIT. Most existing pipelines are made from standard offshore grades of carbon steel. The transported oil and gas often contain corrosive agents such as CO2, H2S, O2, water and sand. These ingredients have, especially in combination with extreme temperatures and pressures encountered, the ability to corrode and erode the pipeline material. Dependent on the agent involved, the corrosion forms are classified as CO2 (sweet) corrosion and H2S (sour) corrosion. Galvanic corrosion may also arise in pipeline systems due to coupling of two dissimilar metals. This situation often occurs in welds where the weld metal and HAZ (heat affected zone) may become anodic to the base metal. The weld also introduces a small, but significant obstacle in the stream, which can in turn lead to flow induced corrosion attacks. ULTRAMONIT consists of a mechanical clamp with transducers and signal multiplexer to be permanently installed on the pipeline. The computer and ultrasonic instrumentation is located in an atmospheric subsea housing carried by an ROV. A specially designed inductive coupler with ROV handle is used for connection between the two units. Multichannel ultrasonic monitoring is implemented by using one measurement channel, with transducers and a suitable signal multiplexer in front. Several concepts for mechanical implementation have been studied, with main emphasis on reliability, long-term survival subsea, and ease of operation and installation. Polymer materials are not 100% watertight for permanent deployment, so our solution is based primarily on the use of metal to keep the water away from the electronics. In addition, pressure compensated design has been used for the permanently deployed components, as this gives some simplifications in design, compared to using conventional atmospheric pressure vessels. The main subsea part of ULTRAMONIT is the instrumented mechanical clamp. A complete clamp consists of two identical sections that are bolted together onto the pipe as illustrated in the first figure. A lot of thought has gone into the design of this clamp to ensure that the transducers and electronics are well protected mechanically and from seawater, while still maintaining sufficient fidelity in the ultrasonic measurements. The first prototypes were based on protection by polymer mouldings. The concept worked fine during laboratory trials, but has later been rejected due to scepticism concerning survival over very long time. The final prototype is therefore made of steel, and with metal barriers against seawater. Each clamp section consists of a main shell with a number of sensor modules fixed to it. Each sensor module has a number of transducers and built-in multiplexer electronics. The electronics is designed with components that can be pressurized, and after assembly, the whole volume is filled up with oil or a two component silicone rubber (SilGel®). 1. Connection between the permanently installed subsea clamp, and the ultrasonic instrumentation carried by the ROV takes place through a specially designed inductive coupler which combines supply of electrical power to the signal multiplexer and sensors in the clamp, and two-way IrDA communication. The inductive coupler is designed for supply of 3 W of power at approx. 12 V.
The coupler is constructed as a splittable two-part transformer. 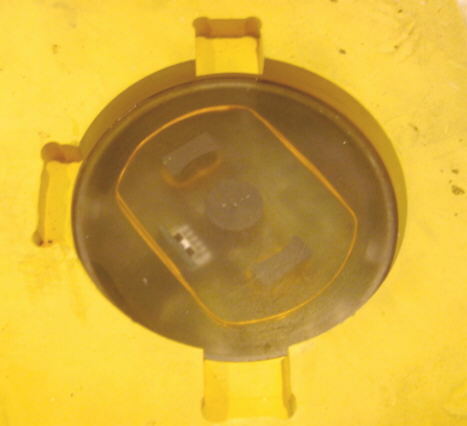 The ROV part of the coupler will only be submersed for limited time, and is therefore made of a plastic material, with wires and core covered by epoxy mould. The subsea section is designed with pressure compensation, and with electrical wires and transformer core covered by SilGel. Proper function of this coupler requires that the gap between the two transformer-halves should be filled with non-magnetic, non-conductive material, which at the same time keeps seawater out. In the prototype, a 2 mm plate of glass was used for this purpose. The orientation required for the IrDA devices to meet properly is achieved mechanically by keyed cuts in the mechanical guide structure for the coupler. There is a very strong correspondence between mechanical tolerances and electrical performance for an inductive coupler. In ULTRAMONIT, only very limited power transfer capacity is required (<0.1W). This is one of the main reasons for choosing an inductive coupler for the application. These fairly slack electrical requirements were easily met with our prototype, we have experienced figures like up to 2-5mm in the gap between the two cores. The mechanical guiding structure has been designed for simple ROV manipulator operation, with a deliberate tolerance of 2 mm horizontally, and 3 degrees in rotation for easy entry into and extraction from the guiding. The nominal gap between the two cores adds up to 3 mm (2 mm of glass, 0.5 mm of mechanical clearance, and 0.5 mm of epoxy coating on the mobile unit). A cup formed structure like this will always collect some sand and dirt, presupposing cleaning by waterjetting before use, possibly also use of a protective polymer cover for the coupler. The ultrasonic instrument is based on an industry standard single board computer, and is placed in a conventionally designed atmospheric housing. This unit contains the more complex parts of the instrumentation. It is therefore considered advantageous that the unit is accessible for upgrade, maintenance and repair also after ULTRAMONIT has been permanently installed. Connection between ROV and the ultrasonic instrumentation is by one cable to provide power and communication. Required power is only 10W, either AC (110-260V, 50 or 60 Hz) or 12v DC, which would normally be available from the ROV control panel. Most ROVs have one or more extra twisted pairs in the umbilical, and since high bandwidth is not important for ULTRAMONIT, it was decided to use a standard analog telephone modem for communication to the surface. This solution gives a bitrate of up to 56k, and access to all the communication technology which has been developed for dial-up modem connections. The computer is a single board pentium class PC, with FreeBSD or Linux operating system. In addition to telephone modem, this computer has 10/100Mbit ethernet and RS232/422/485, in case operation via the ROV's control system should be more desirable. It is quite possible to monitor continuously with ULTRAMONIT, but for subsea use it is assumed that it will be more beneficial to interrogate the system with ROV, and possibly in connection with ROV activities that are carried out for other purposes. All measurements (raw data and derived calculations) are kept in the database and marked with name of field or plant, pipesystem, weld ID, transducer ID, date and time. The database is organised as files in a tree structure to allow manual look-up and analysis. By clicking downwards into the tree, it is possible to look closer into each clamp, each transducer, and finally each individual measurement. ULTRASONIC MEASUREMENT ACCURACY Ultrasonic thickness measurements can be very accurate if the acoustic conditions are favourable (planar surfaces, homogeneous material and large dimensions compared to acoustic wavelength). An experiment was carried out with a test specimen to study the potential accuracy of ULTRAMONIT for thickness monitoring. The test piece was a block of ST52 grade steel, with four milled slots with space for three ULTRAMONIT type of transducers in each. The depth of each slot was carefully machined to give remaining thickness of 10 mm for slot 1 and 2, 11 mm for slot 3, and 12 mm for slot 4. For the actual experiment, the test piece was mounted in a CNC milling machine upside-down compared to the picture above, and milled down in controlled steps of 0.05 mm. Between each pass of the mill, the measured waveform from all ultrasonic sensors was recorded. The experiment was completed after collection of 12 passes of the mill. The reason for doing this experiment with more than just a couple of transducers was to gain some experience and statistics on absolute and relative accuracy with this kind of simple transducer design. Signal analysis was based on extraction of thickness from the autocorrelation of the received waveforms and a P-wave velocity of 5950 m/s. Example of signal analysis, raw signal (upper), and correlation signal with indicated thickness. The signal analysis was carried out for all transducers and each step in the milling, and the results were compared to the expected values. Due to the fabrication and mounting procedure in the CNC machine, initial absolute accuracy in thickness was not better than 0.1mm, and the whole experiment is therefore mostly relevant for analysis of change in thickness. The resolution in the measurement system for the CNC milling machine was ±0.02 mm. For a thickness monitoring application, the relative accuracy is the significant measure. A change in thickness of 0.02 mm should therefore be detectable. A remark is appropriate at this point: These figures are obtained under ideal conditions with a machined piece and plane surfaces. Real world objects are normally much more complex than the machined specimen in the preceding section. 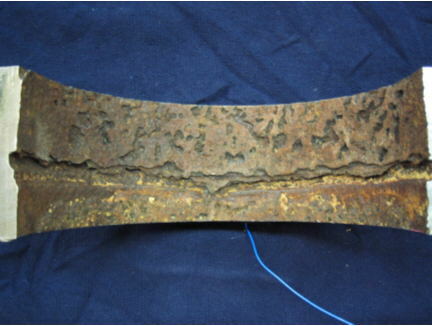 A severely corroded weld with pits scattered around is shown below as an example. The performance of ULTRAMONIT type of measurements on real corroded specimens was studied through a student project during the summer of 2003. 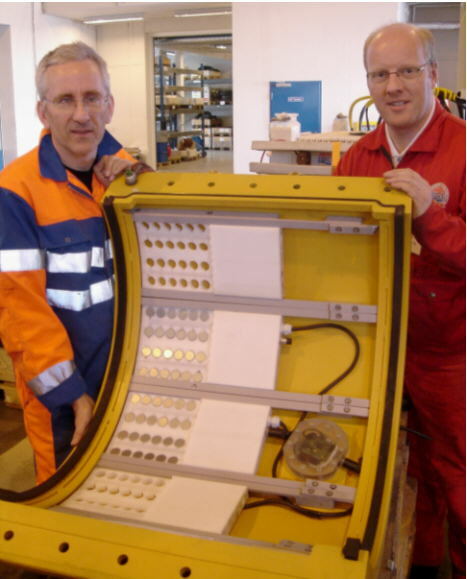 A variety of test specimens from the Statoil materials research department were instrumented and measured with the ultrasonic instrumentation described above. In this work, the raw signals were recorded, together with best possible reference data (thickness) about the test pieces. Analysis was carried out later using numerical tools like MATLAB. Sophisticated methods with high resolution (correlation methods) that work well for ideal geometry (plane parallel surfaces) may give considerable errors or totally fail when used on samples with real corrosion. It must be pointed out here that the main idea with ULTRAMONIT is to monitor development of corrosion, and the interesting parameter is how accurately a change of thickness due to real corrosion can be measured. In pipeline systems, corrosion attacks most commonly occur in or near the weld. This area is therefore most interesting for ULTRAMONIT instrumentation, and some experiments have been carried out to look at ULTRAMONIT performance in this area. A prototype of ULTRAMONIT as described in this paper was installed at the Statoil operated Kårstø gas processing plant in December 2003. The instrumentation of that installation is very similar to what is described here, but the packaging and sealing concept is different due to EX requirements. Analog telephone was available very close to the measurement location, so the prototype instrumentation is hooked up to a telephone line, for remote access via conventional dial up connection. The test specimen in this case is a bend from a 12" pipe with a CO2 corroded weld. A version of the ULTRAMONIT transducer was fixed to the pipe to watch further development of this real corrosion. The interesting parts of the waveforms were extracted and are shown in the plot below. In these raw waveforms, the first ultrasonic event starting at around 0.0 mm wall thickness corresponds to the outer surface reflection from the pipe. The smaller event which is displaying a clear trend from around 8.1 to around 7.6 mm corresponds to the reflection from the inner surface which has been naturally corroded during the 21 first weeks of the test period. The trend line which gives the corrosion rate can be determined from this plot by placing a ruler through the first break of the first arriving acoustic event as indicated above. There is a complication to this straightforward approach. If measurement geometry had been ideal (plane parallel surfaces) this would be simple. Thinning would manifest itself as a clean small time-shift of the reflection from trace to trace. However, when the acoustic target is small compared to wavelength and beam width, wave propagation effects come in to play. The result is that we get changes in phase and amplitude of the reflected echo, in addition to the pure time shift caused by the corrosion. More sophisticated signal processing will thus be necessary to obtain corrosion rates over time. Manufacturers of ultrasonic equipment  commonly specify the possible resolution obtainable with ultrasonic thickness gaging to be in the order of ±0.01mm. Real world effects like surface condition, coupling/orientation, and measurement geometry will generally be much more significant for measurement accuracy than electrical resolution which the instrument makers tend to specify. For this reason, more appropriate accuracy figures range from ±0.1mm to ±0.2mm [2,3], and this does of course depend on the particular application at hand. Real users who have to carry out these measurements under conditions which can be very rough from a measurement-technical point of view will experience even lower performance. We can here mention that the accuracy with conventional manual UT measurement for corrosion at the Kårstø plant is judged to be around 1 mm based on many years of experience. The Time-of-Flight-Diffraction-technique (TOFD) , is by many considered the most advanced ultrasonic scanning method. It consists of scanning a pair of angle-beam transducers along a line (for example a weld), while the ultrasonic waveform is recorded. Data are presented as a gray scale raster scan image, with ultrasonic propagation time on the first axis, and position along the weld on the second. The ultrasonic amplitude is represented as pixel intensity or colour. The method was pioneered by AEA in the 1970's, and this kind of imaging technology has benefited vastly from the introduction of the PC and all that came with it. Today, TOFD and similar technology can be purchased from many suppliers. Although TOFD is considered the most sophisticated ultrasonic scanning method, it is primarily intended for detection and sizing of defects, like cracks in a weld. For corrosion assessment in or near a weld it has the advantage that it is possible to measure without placing the probe immediately onto the weld which is often not possible or desired. But apart from this, a conventional straight P-wave probe should measure the thickness more accurately in the general case compared to using a pair of angle-beam probes. This is very likely the reason why suppliers of TOFD do not specify better accuracy than 0.5mm when the method is used for corrosion assessment . It is our ambition that permanently installed equipment like ULTRAMONIT can be used to improve the performance of ultrasonic monitoring measurements an order of magnitude, for example to bring the usable accuracy from figures like 1mm to 0.1mm. This material is based on work carried out by Sensorlink AS in cooperation with Statoil ASA. Funding for the work comes from the Statoil Research programme "New Ideas".